Risk is part of all our lives. We need to take risks to grow and develop. Effectively managed risk in hospitals, airport security, construction sites, projects, programmes, portfolios and in so many more circumstances help societies achieve. Management of risk involves identification, assessment, and prioritization of risks. Coordinated and economical application of resources to minimize, monitor, and control the probability and/or impact of unfortunate events or to maximize the realization of opportunities. Figure 1 shows what is involved in risk management. Identifying, analysing and evaluating risks are all part of risk assessment and will be further analysed in the risk assessment section. Because risk is inherent in everything we do, risk professionals undertake roles that are very diverse. It includes roles in insurance, business, health and safety, corporate governance, engineering, planning and financial services to name a few. In this article important principles of risk management will be outlined, risk assessment will be explained in detail and risk assessment tools explained. Benefits and limitations of risk management will be discussed before stating the conclusions. Organizations of all types and sizes face internal and external factors and influences that make it uncertain whether and when they will achieve their objectives. Risk is the effect this uncertainty has on an organization's objectives. Risk can be managed by identifying it, analysing it and then evaluating whether the risk should be modified by risk treatment in order to satisfy their risk criteria. Constant communication and consultation with stakeholders is a key for the process to run smoothly as well as monitoring and reviewing the risk and making sure that the correct actions are taken to ensure that no further risk treatment is required. Risk management can be applied to an entire organization, at its many areas and levels, at any time. It can also be applied to specific functions, projects and activities. As can be seen in figure 1, the first step is to establish the context in order to figure out the individual needs, audiences, perceptions and criteria for each specific sector while applying risk management. Establishing the context will capture the objectives of the organization, the environment in which it pursues those objectives, its stakeholders and the dicersity of risk criteria. those factors will help reveal and assess the nature and complexity of its risks. As well as helping organizations reach these objectives the standard is intended to meet the needs of a wide range of stakeholders. Stakeholders that are included are those responsible for developing risk management policy within their organization, those accountable for ensuring that risk is effectively managed within the organization as a whole or within a specific area, project or activity. Those who need to evaluate an organization's effectiveness in managing risk and developers of standards, guides, procedures and codes of practice that, in whole or in part, set out how risk is to be managed withing the specific context of these documents. Figure X shows the relationships between the risk management principles, framework and process. The following principles should be complied with by an organization in order for risk management to be effective. Creates and protects value - Contributes to the demonstrable achievement of objectives and improvement of performance in, for example, security, environmental protection, project and program management. Integral part of all organizational processes - Risk management is not a stand-alone activity that is separate from the main activities and processes of the organization. It is part of the responsibilities of management and an integral part of all organizational processes, including strategic planning and all project and change management processes. Part of decision making - Helps decision makers make informed choices, prioritize actions and distinguish among alternative courses of action. Explicitly addresses uncertainty - Risk management explicitly takes account of uncertainty, the nature of that uncertainty, and how it can be addressed. Systematic, structured and timely - A systematic, structured and timely approach to risk management contributes to efficiency and to consistent, comparable and reliable results. Based on the best available information - The inputs to the process of managing risk are based on information sources such as historical data, experience, stakeholder feedback, observation, forecasts and expert judgement. Decision makers should however inform themselves of, and should take into account, any limitations of the data or modelling used or the possibility of divergence among experts. Is tailored - It is aligned with the organization's external and internal context and risk profile. Takes human and cultural factors into account - Recognizes the capabilities, perceptions and intentions of external and internal people that can facilitate or hinder achievement of the organization's objectives. Is transparent and inclusive - For risk management to be relevant and up-to-date, appropriate and timely involvement of stakeholders and, in particular, decision makers at all levels of the organization has to be ensured. By doing so also allows stakeholders to be properly represented and to have their views taken into account in determining risk criteria. Is dynamic, iterative and responsive to change - Continually senses and responds to change. As external and internal events occur, context and knowledge change, monitoring and review of risks take place, new risks emerge, some change, and others disappear. Facilitates continual improvement of the organization - Organizations should develop and implement strategies to improve their risk management maturity alongside all other aspects of their organization. Significant risks to the achievement of its business objectives. All types of risks, associated major components and controls currently in place, from all sources, across the entire scope of the organisation's activities. Risks around opportunities as well as threats, to increase the organization's chance of maximizing the benefit of those opportunities when they arise. It would also ensure that the organization is aware of its major risks at any point in time. To briefly summarize, it is a process that involves finding, recognizing, and describing the risks that could affect the achievement of an organization's objectives. In this process questions such as: what can happen? when and where? how and why? should be answered in order to move to the next step in the risk assessment process, risk analysis. A pre-defined rating scale is used to prioritize the identified project risks. The probability or likelihood and the impact on a project objectives should they occur gives the score for a certain risk. A qualitative risk analysis also includes the appropriate categorization of the risks. Source-based or effect-based. A further analysis of the highest priority risks during which a numerical or quantitative rating is assigned in order to develop a probabilistic analysis of the project. Possible outcomes for the project are quantified and the probability of achieving specific project objectives is assessed. When there is uncertainty a quantitative approach can be used to make decisions. It also creates realistic and achievable cost, schedule or scope targets. To summarize the concept: It is a process that is used to understand the nature, sources, and causes of the risks that an organization has identified and to estimate the level of risk. Also used to study impacts and consequences and to examine the controls that currently exist. Risk evaluation is the process by which organizations, individuals and other social groups within society determine the acceptability of a given risk. If a risk is judged as unacceptable, adequate measures for risk reduction are required. Standards derived from discursive processes such as roundtables, deliberative rule making, mediation, or citizen panels. There are many tools used in risk assessment, sometimes it is recommended to use more than one tool in risk assessment. They all have their own focus areas. Lets take a better look at the most frequently used tools. Was initially developed to analyse chemical systems, but has been extended to other types of systems and complex operations. It is a technique to identify risks to people, equipment, environment and/or organizational objectives. The technique is qualitative and uses guide words which question how the design intention or operating conditions might not be achieved in the design, process, procedure or system. Lastly, it identifies failure modes of a process, system or procedure, their causes and consequences. Originally developed as a simpler alternative to HAZOP. It uses standard 'what-if' type phrases in combination with the prompts to investigate how a system, plan item, organization or procedure will be affected by deviations from normal operations and behaviour. It is normally applied at a more of a system level with a lower level of detail than HAZOP. 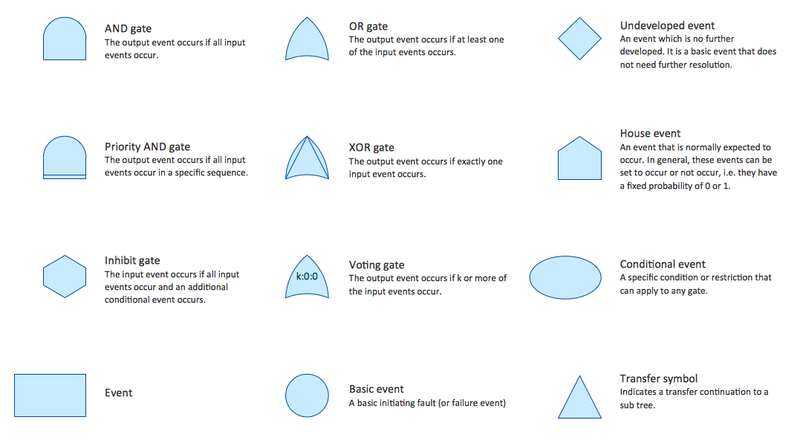 Fault tree analysis is a technique for identifying and analysing factors that can contribute to a specified undesired event (called the "top event"). Causal factors are deductively identified, organised in a logical manner and represented pictorially in a tree diagram which depicts causal factors and their logical relationships to the top event. 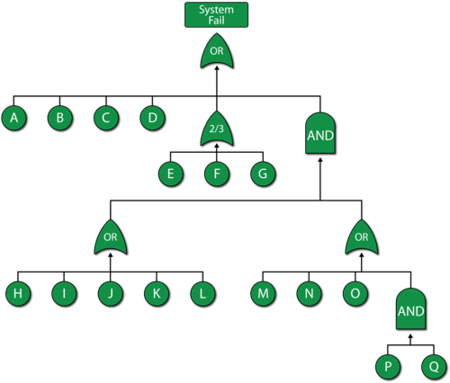 A fault tree may be used qualitatively to identify potential causes and pathways to a failure (the top event) or quantitatively to calculate the probability of the top event, given knowledge of the probabilities of causal events. These benefits can be achieved if risk management is run effectively. As figure 1 shows, communication and consultation as well as monitoring and reviewing are key factors for a successful risk management. There are of course limitations to risk management, otherwise organizations would never experience failure as they would have answers to everything if the risk management process had been done properly. The first limitation is regarding prioritizing, by prioritizing the risk management processes too highly could keep an organization from ever completing a project or even getting started. Second is regarding if risks are improperly assessed and prioritized, time can be wasted in dealing with risk of losses that are not likely to occur. Spending too much time assessing and managing unlikely risks can divert resources that could be used more profitably. It is inevitable that unlikely events will occur at some point. If the risk is unlikely enough to occur sometimes it may even be better to simply retain the risk and deal with the consequences. Third is about qualitative risk assessment, it is subjective and lacks consistency. To summarize, an assessment process that subjects all risks to the same analytical grid has shortcomings that need to be recognized. If very little happens as a result of an organization's risk assessment process, it is a clear sign that alternative approaches should be considered. I think it is safe to say that risk management is very important for every organization in order to maximize the probability of achieving their objectives. There is a wide range of tools that can be used in different circumstances in risk management. Every organization should find the proper tools and perform risk management no matter their size. As stated in the limitation section, risk management can also have its flaws. Communication strategies as well as constantly reviewing and monitoring the process are the most likely ways to prevent these flaws to occur.